Yul Brynner at the 29th Annual AMPAS Academy Awards, Wednesday, March 27, 1957, at the RKO Pantages Theatre, Hollywood, California. Yul Brynner was merely another promising actor — until he snagged the lead in The King and I. His exotic looks and strong presence made him a one-of-a-kind star. Born to well-to-do parents, Yul was of Swiss, German, Russian and Buryatian descent. His father Boris, was a mining engineer. His mother Natalya, was an intellectual, who studied acting and music. While on a business trip, Brynner's father fell in love with an actress, causing him to abandon his family. Natalya relocated herself, her daughter Vera, and son Yul, to Harbin, China in 1923. Fearing war between China and Japan, Natalya relocated the family again, this time to Paris, France, where brother and sister would play the guitar and sing, respectively, in cafés and nightclubs. Brynner trained to become a trapeze performer, touring with a small French circus for five years, until injuring his back. He then turned to the notion of acting. In 1938, Natalya was diagnosed with leukemia, so she and Yul moved back to Harbin(!). With sister Vera making a living as a singer in New York City, U.S.A., Yul and Natalya joined her there in the big city on October 25, 1940. Brynner, already fluent in several languages, studied English assiduously. So assiduously in fact, that Brynner made his Broadway debut as Fabian, in a production of Shakespeare's Twelfth Night in 1941. Money was tight, with Brynner working as a fashion model as well as doing nudes for George Platt Lynes in 1942. During World War II, Brynner worked for the U.S. Office of War Information, reading over the radio in French to occupied France. Since he was U.S.-based, he also studied acting with Michael Chekhov, who had directed Twelfth Night. In 1944, Brynner married actress Virginia Gilmore, and drifted into directing shows at CBS Television in New York. He co-starred on Broadway as Mary Martin's husband in the musical Lute Song in the 1946 season. Brynner made his film debut in Port of New York (released in November, 1949). Mary Martin suggested that Brynner audition for the role of King Mongkut in the musical The King and I in its original production in 1951, opposite Gertrude Lawrence. Brynner not only got the part, he received the Tony Award for his performance in the long-running show. He played the role until March of 1954, then did a 30-city U.S. Tour, which ended in December, 1955. 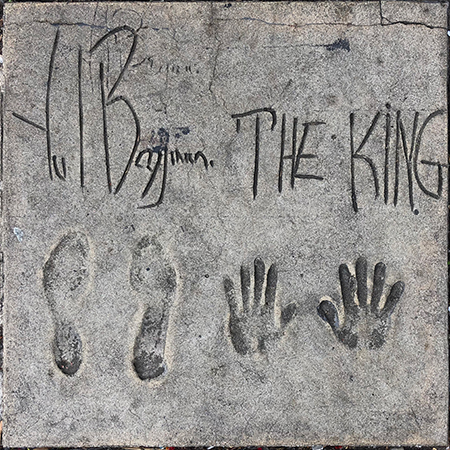 So famous had Brynner become for The King and I, that when it came time to make the film version, he was such a shoe-in that, during the shoot at the 20th Century-Fox studio, he and co-star Deborah Kerr made their foorprints in abstensia for eventual installation in the Grauman's Chinese Forecourt. The King and I (which world premiered at the Chinese in June, 1956) became a legendary picture with Brynner winning the Oscar for his role in the film. Cecil B. DeMille chose him to play opposite Charlton Heston in his own remake of The Ten Commandments (released in October, 1956). He appeared at year's end in Anastasia (which played the Chinese in December, 1956) with Ingrid Bergman. So now, Yul Brenner was a movie star. M-G-M put him in their adaptation of The Brothers Karamozov (released in February, 1958), and he played pirate Jean Lafitte in The Buccaneer (released in December, 1958). He reteamed with Deborah Kerr in The Journey (released in February, 1959), and (with a toupée) The Sound and the Fury (released in March, 1959) with Joanne Woodward, but both films flopped. In replacing Tyrone Power in Solomon and Sheba (released in December, 1959) with Gina Lollobrigida, Brynner had another hit. Teaming with Director Stanley Donen, Brynner attempted comedy with Once More with Feeling! (released in February, 1960), and Surprise Package (released in September, 1960). His role in The Magnificent Seven (released in November, 1960) fared much better. Around this time, he was divorced from Virginia Gilmore and remarried. After Tarus Bulba (released in December, 1962) came out, Brynner signed a three-picture deal with the Mirisch Corporation, making Kings of the Sun (released in December, 1963), Flight from Ashiya (released in March, 1964), and Invitation to a Gunfighter (released in October, 1964). But Brynner's time as a headliner in films was clearly over. Undaunted, he appeared in Morituri (released in August, 1965), Return of the Seven (released in October, 1966), The File of the Golden Goose (released in June, 1969), and The Madwoman of Chaillot (released in October, 1969). Brynner stared in a spaghetti western, Adiós, Sabata (released in Italy in September, 1970), did a supporting role in The Light at the Edge of the World (released in July, 1971), and headlined in Romance of a Horsethief (released in August, 1971), and Catlow (released in October, 1971). In 1972, Brynner returned to his most famous role in Anna nd the King opposite Samantha Eggar on CBS in 1972. In Westworld (released in August, 1973), Brynner enjoyed a hit film in a role he seemed uniquely suited to. He played a similar role in The Ultimate Warrior (released in October, 1975), and the same role in the Westworld sequel, Futureworld (released in August, 1976). His last film was the Italian Con la rabbia agli occhi - Death Rage (released in Italy in October, 1976). After this, Brynner toured extensively in The King and I on stages around the country, as well as a Broadway revival in 1977, and a London production in 1979, and once more on Broadway in 1985. It is calculated that Brynner played King and I 4,625 times. 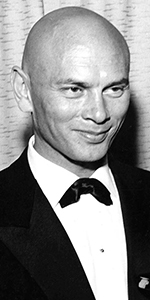 A life-long heavy smoker who quit in 1971, Brynner developed lung cancer during the 1985 tour of King and I. He died of the disease in October, 1985, at the age of 65. 20th Century-Fox Studios, Los Angeles, California. Yul Brynner Footprinting ceremony, Thursday, March 22, 1956. 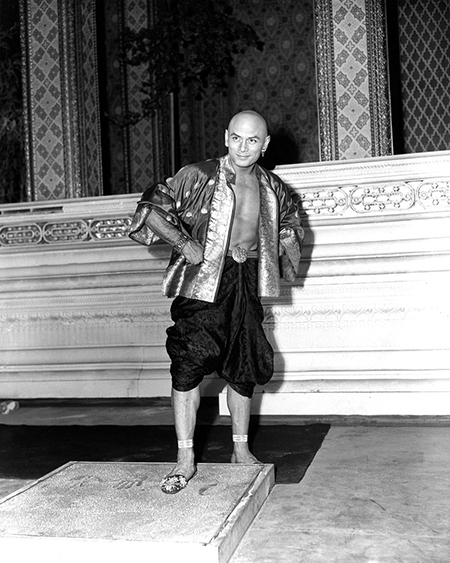 Yul Brynner makes his imprints on the set of The King and I.